Coming amid rumors of a next-generation iPhone with dual lenses, an Apple patent application published Thursday reveals a setup that features both wide angle and telephoto cameras. According to Apple's patent filing for a "Small form factor telephoto camera," published by the U.S. Patent and Trademark Office, the company is investigating ways to fit two cameras into a portable device. Specifically, Apple's invention proposes a separate small format telephoto camera be used in conjunction with a normal-to-wide angle camera like those found in current iPhone models. Considering physical restrictions and the current state of imaging technology, a dual-camera implementation would likely yield higher quality images than a comparable single-lens system with integrated optical zoom. 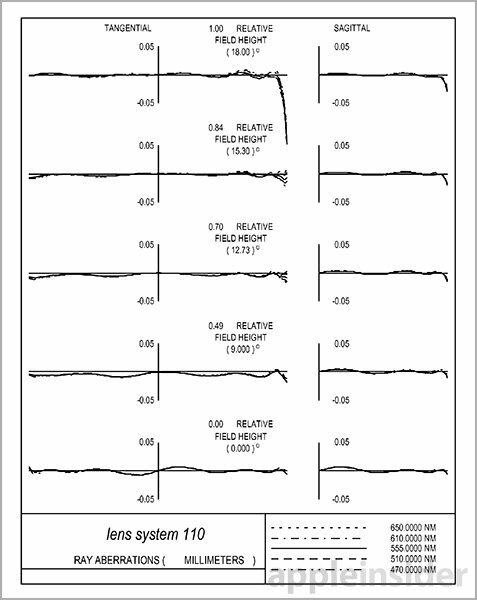 The document details a telephoto camera system with a total track length of 6mm or less, focal length of about 7mm and telephoto ratio within 0.74 and 1.0. The overall TTL/f must be less than or equal to 1.0 to be considered a telephoto lens system. In some embodiments, the telephoto camera may be equipped with an adjustable iris or aperture stop which, assuming a 36-degree field of view, would allow for focal ratios from about 2.4 to 10.0. In practice, Apple's invention is a traditional digital camera arranged for telephoto photography. Light enters a lens assembly through an aperture and passes through infrared or other corrective filters to form an image on an image plane at or near a photosensor. 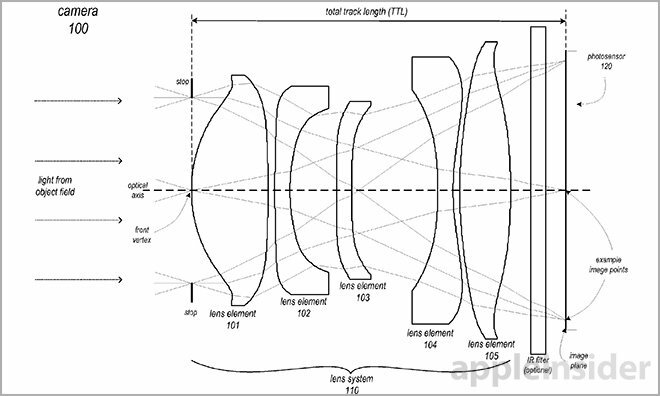 Like current iPhone cameras, the proposed telephoto system calls for multiple lens elements, in this case four or five separate refracting components made from plastic, glass or other suitable transparent materials. Also like modern iPhone shooters, the patent application makes note of a camera sensor with pixels sized at 1.2 microns or less. A large chunk of the document details a variety of potential lens surfaces, magnification, curvatures and other physical dimensions. Also covered are light spectrums, optical prescriptions and solutions for chromatic aberrations. Apple owns a number of patents relating to iPhone camera improvements, including IP describing a dual-sensor system that combines image data for high quality output. Other patents detail more exotic arrangements like a three-sensor camera with light-splitting cube for enhanced low-light performance, as well as a three-sensor, three-lens configuration for better color reproduction. Late last year rumor had it that Apple was working on a dual-lens solution for its next-generation iPhone. Since that initial report, industry insiders have offered diverging opinions on the matter, with some saying the system will make it into the so-called "iPhone 6S," and others denying such claims. Adding to intrigue, Apple recently disclosed the purchase of LinX Imaging, an Israeli company specializing in multi-aperture imaging technology. For $20 million, Apple bought access to a cache of inventions that leverage a plurality of camera sensors and special software to produce high-resolution images in both 2D and 3D formats. Apple's compact telephoto camera patent application was first filed for in October 2013 and credits Romeo I. Mercado as its inventor.